Chelsea have sealed their first signing of the winter transfer window with Christian Pulisic joining them from Borussia Dortmund for a fee in the region of £59m. The United States international had been heavily linked with the Blues in recent weeks with compatriot Eddie Johnson even dropping a transfer hint on social media. Amidst this, Dortmund have finally confirmed that the attacker has agreed to join the Blues, though the west London side have accepted to loan him back for the remainder of the campaign. “Borussia Dortmund has agreed with the English Premier League club FC Chelsea on a transfer of Christian Pulisic with immediate effect. The British in turn lend the player until the end of the current season to BVB," a statement on their website read. 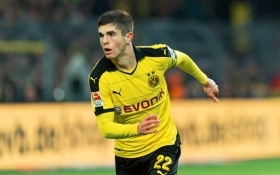 Pulisic had only 18 months remaining on his existing deal with Dortmund and the failure to negotiate an extension meant that they took the option to sanction his sale rather than hope for a breakthrough. The attacker has found himself regularly on the bench this term with the emergence of Jadon Sancho at Dortmund but he could feature more extensively hereafter, given his future has been resolved.